Easily one of the most iconic and beloved semi-automatic pistols of all time, the 1911 is a timeless design that has been around for over a hundred years and will likely be around for a hundred more. But what makes the 1911 so adored by shooters? Just as importantly, what specific brands of 1911 stand out above the rest and should be the top ones for you to consider should you decide to buy a 1911? We’ll answer these questions in this article. WHAT MAKES THE 1911 SO GREAT? The reality is that there is a great multitude of things that make the 1911 a great pistol. The 1911 is not for everyone. There are pistols out there that are lighter, simpler, and carry more bullets, but no one can deny that there are specific attributes about the 1911 that have made it such an enduring pistol. Accuracy. The 1911 is a highly accurate pistol thanks to its fixed barrel design, light trigger, soft recoil, and longer sight radius. Is it the most accurate production pistol made? That’s debatable, but its accuracy is a major plus. Light Trigger. The trigger of the 1911 alone makes it a dream to shoot. It’s very light and crisp, with a relatively short reset. The light trigger pull makes it unsafe to carry the 1911 chambered and cocked without the safety on, so you must train yourself to manually switch off the safety when drawing the weapon to fire. Nonetheless, the trigger on the 1911 is one of the biggest appeals. It makes it an excellent handgun to shoot for target practice, competition, or for tactical training. Slim Design. The 1911 is a naturally slim possible, which means shooters with smaller hands can comfortably grip the weapon and it’s easy to conceal carry. The obvious trade-off is fewer bullets in the magazine (the standard 1911 magazine holds either 7 or 8 rounds). Customization. The 1911 is one of the most customizable firearms on the planet. The AR-15, Glock, and Ruger 10/22 are the only other guns that can match it for the number of spare accessories and add-ons that you can buy. This means you can customize your 1911 to be exactly the way you want it to be. For SHTF purposes, this means that spare magazines and parts will be relatively easy to find in comparison to other pistols. Power. Most 1911s are chambered for the .45 ACP caliber, which is a very powerful bullet that will put a big hole in its target. While 1911s are also available in other calibers such as .22 LR or 9mm, if you’re going to buy a 1911, most would agree that it should be in .45. None of this is to say that the 1911 is not without faults. It has a more complicated takedown procedure than more modern pistols. It is heavy, only holds 7-8 rounds in the magazine. And most 1911 guns require a break-in period of around 200-300 rounds before they can become reliable. Still, the 1911 reigns supreme as one of the most popular pistol designs of all time. It’s a perfectly valid option as a range gun, for professional competition shooting, as a home defense gun, or for an SHTF sidearm. Colt was the original manufacturer of the 1911 (using John Browning’s design), and the phrases “Colt 1911” and “Colt 45” have now become iconic. Colt 1911s today are known for their reliability right out of the box. Go to Colt’s website, and you will find a wide variety of different models available. 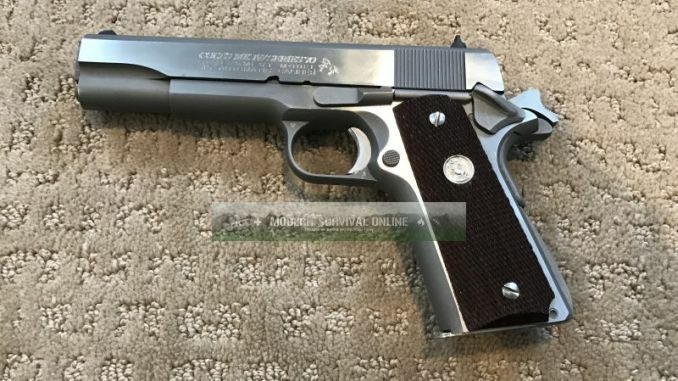 Colt produces classic models such as the Mark IV Series 70 based on the original M1911A1. It was issued to troops in World War II, but they also make modern options such as the Rail Gun that are made for duty use, the Gold Cup built for competition shooting, the Commander model with a shorter barrel, and the Defender with an even shorter barrel and grip. Another high-quality option for a 1911 is Kimber, with their custom model available in a wide variety of calibers and configurations. Not only can you buy the Kimber Custom in .45 ACP, but it’s also available in .38 Super, 9mm Luger, 10mm AUTO, and even .40 S&W. The Custom model uses a full-length guide rod (in contrast to most 1911s that use a shorter length guide rod), and modern upgrades such as forward serrations, a beavertail grip safety, extended thumb safety, and a beveled magazine well for faster and smoother reloading. The Custom TLE II and Warrior models are also available, which are designed for military and law enforcement use. These are an excellent choice for a duty weapon or as a durable SHTF sidearm. As with Colt, Kimber 1911s are highly expensive, but as the old saying goes, you have to pay for quality. Ruger began producing 1911s only a few years ago, but they have quickly proven themselves to be one of the best 1911 manufacturers on the market. The Ruger SR1911 is their standard line, which is available in both the full 5-inch and the shorter 4.25-inch Commander sized barrel versions. Whereas most 1911s use a Series 80-style firing system, the SR1911 uses the more traditional Series 70-style firing system just like the Colt Mark IV Series 70. Many 1911 aficionados prefer a Series 70-type model. It’s regarded as being the original firing system of the 1911, and 70 models also tend to have a lighter trigger system than 80 models. ‘Series 70’ and ‘Series 80’ are currently trademarks owned by Colt, but the terms are still used to denote the specific firing systems. The Series 80 simply has an internal safety system that prevents the possibility of discharge should the gun be dropped and the hammer falls on its own. The Ruger SR1911 also comes equipped with modern parts such as an extended thumb safety and beavertail grip safety, and forward cocking serrations. In essence, it represents the traditional 1911 firing system integrated with modern upgrades. The SR1911 is also very reasonably priced in the $700 to $800 range and sometimes can be found for even less than that. Many consider Springfield to offer the best quality for the money. Their 1911s are routinely priced less than $1,000 (other than the premium models), and they make an extremely wide variety of model options. Springfield makes practically any kind of 1911 you can think of, from the standard G.I models, like what the troops carried in World War II, to competition ready guns or duty 1911s with modern upgrades and concealed carry variations with shorter grips and barrels. They are also available in different calibers as well. The neat thing about Springfield is how they will ship many of their 1911s with three magazines (instead of the standard two), with a holster and double mag holder. This essentially gives you a complete kit right out of the box and can save you on money for accessories that you would have to buy anyway. If you want the best 1911 possible and are willing to pay for it, many would say that you should go with Wilson Combat. Not only does Wilson manufacture high-quality parts and accessories for 1911s that can be added to other brands, but they also manufacture actual 1911’s themselves. Wilson originally got started manufacturing spare parts and customization options for the 1911, Smith & Wesson Model 10, and Remington 870. Since then, however, they have become the most well-known for the aftermarket parts they produce for the 1911. Some other 1911 manufacturers will even install Wilson Combat parts on their production guns, and many people also will customize their 1911s with Wilson Combat parts to enhance performance. Wilson Combat 1911s are not only popular with civilians. They also have been utilized extensively by military and police forces. They have seen action all around the world, and are guaranteed to deliver one-inch groups at twenty-five yards. For a premium 1911, Wilson Combat should be a top option. Even if you can’t afford a Wilson Combat 1911, you can always buy from another manufacturer and then customize it with Wilson parts. If the 1911 is your dream gun, these five manufacturers should be your top choices. Even though the 1911 has become a little outdated in some ways when compared to the more modern, polymer framed guns, it’s not a gun that’s going to be going away anytime soon either. They truly are a joy to shoot, and if you spend the time learning how to use one, the 1911 can save your life in a life-or-death situation as well. 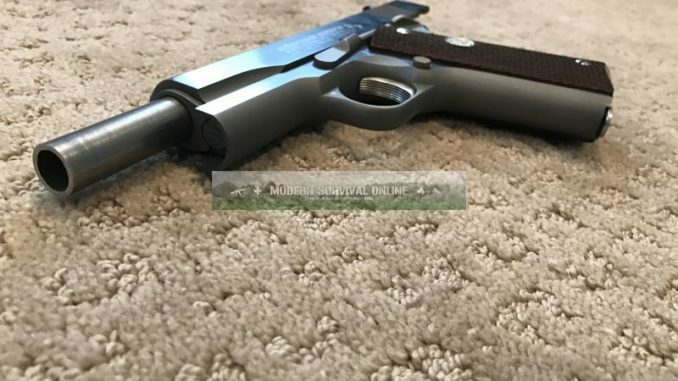 Not to throw a wet blanket on your fine article, but the 1911 does not have a fixed barrel. I have a number of M1911A1 pistols, including several you mentioned. I am not a target shooter, so accuracy per se is not a big consideration with me. My favorite M1911A1 is a Mitchell Gold from 1994, but any well made version will get the job done. IF YOU ARE GOING TO BUY A 1911. 45 CAL. Refuse to learn – that’s an incredible liability! Glad to see Ruger on the list. I was checking one out the other day and it looked really nice. I’m curious, I know Kimber is a well respected brand for assembly line 1911’s, but I’ve heard many complain about their build quality falling off in recent years. Mostly QA really but consistantly NOT being fully functional OOB. Other’s, like sig for instance, are consistantly left off lists like this, however when you go look, you see nothing but praise for them. I’m glad to see Ruger make this list, they often get overlooked but I own a Sig 1911 as well, and it is AWESOME. You can feed just about anything through it and it eats it up. Very accurate, great trigger, fit and finish excellent even going on 10 years of ownership and CC. It checks all the boxes. Then you add a WC to your list. Here is another I have a little issue with. WC’s ARE excellent guns, but have a rather bad rep of not feeding low quality/range ammo very well. That’s a down check for reliability.